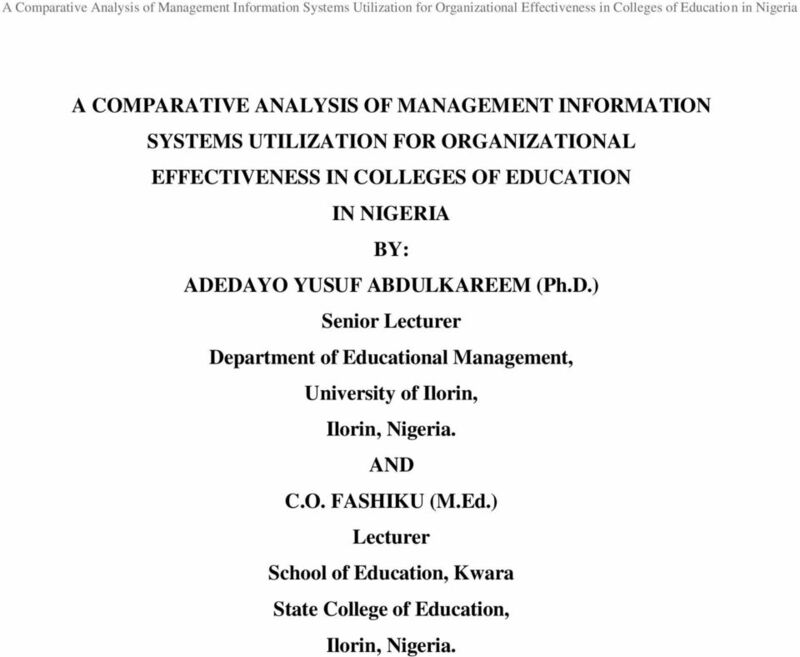 Download "A Comparative Analysis of Management Information Systems Utilization for Organizational Effectiveness in Colleges of Education in Nigeria"
1 A COMPARATIVE ANALYSIS OF MANAGEMENT INFORMATION SYSTEMS UTILIZATION FOR ORGANIZATIONAL EFFECTIVENESS IN COLLEGES OF EDUCATION IN NIGERIA BY: ADEDAYO YUSUF ABDULKAREEM (Ph.D.) Senior Lecturer Department of Educational Management, University of Ilorin, Ilorin, Nigeria. AND C.O. FASHIKU (M.Ed.) Lecturer School of Education, Kwara State College of Education, Ilorin, Nigeria. 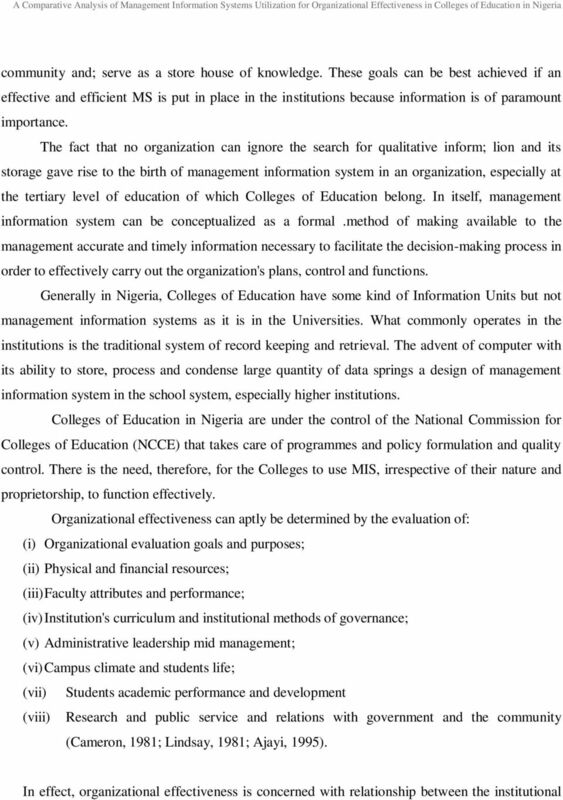 2 Abstract This report is on a comparative analysis of management information system utilization far organizational effectiveness in Colleges of Education in Nigeria. One thousand six hundred and seventy respondents were randomly selected using stratified random sampling technique from 24 out of the existing 65 Colleges of Education in Nigeria. 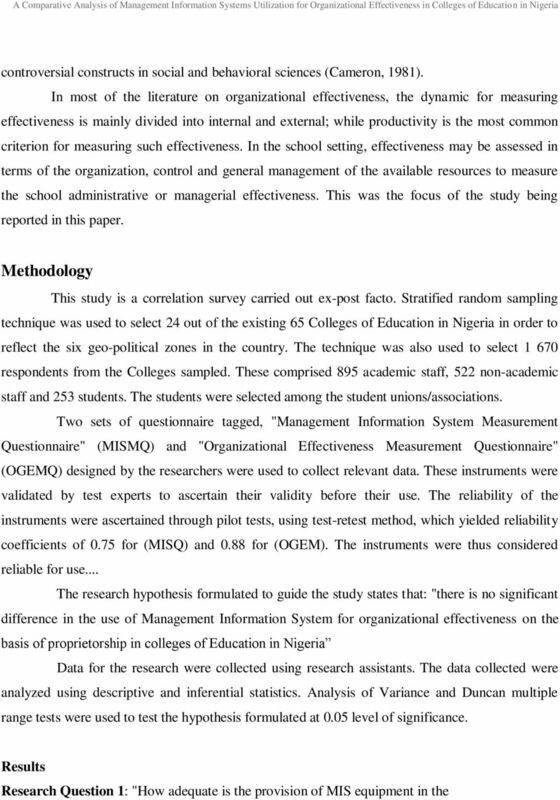 The sample consisted of 895 academic staff, 522 non-academic stuff and 253 students from the colleges Self-designed instruments tagged, "Management Information System Measurement Questionnaire" (MISMQ) and "Organizational Effectiveness Measurement Questionnaire" (OGEMQ) were used to collect relevant data. These were validated by research experts. The reliability of the Instruments were ascertained through pilot tes~ using test-retest methods to obtain reliability coefficients of 0.75 and 0.88 for M1SMQ and OGEMQ respectively. The data collected were analyzed using descriptive and inferential statistics. Analysis of variance and Duncan multiple range tests were used to test the hypothesis formulated at 0.05 level of significance. 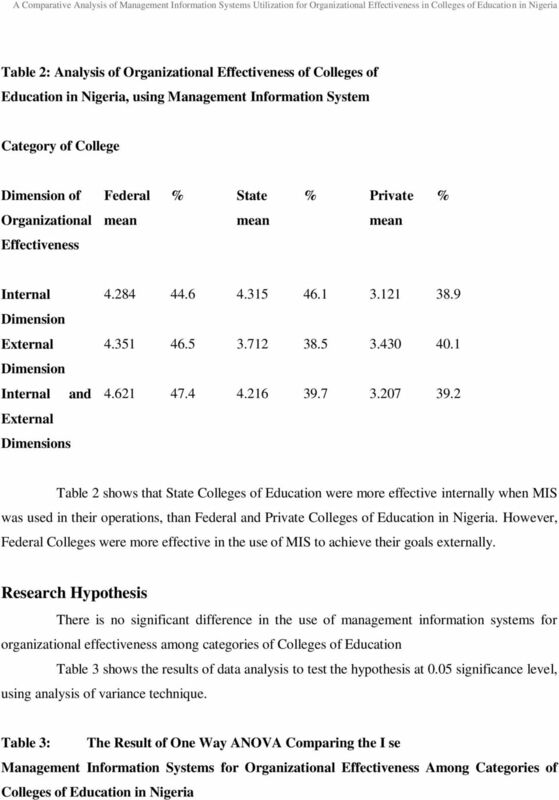 The findings revealed that Federal Colleges of Education ranked first in MIS utilization for organizational effectiveness in Colleges of Education in Nigeria. Next in the rank order was the State Colleges whose means score was greater than those of the privately owned Colleges of Education in the country. Based on the findings, it was concluded and recommended that: Federal Government should establish Management Information Units in all the Colleges of Education in Nigeria while the units should be well funded. Institutional managers should be mandated to be using MIS in their administration. Furthermore, Federal Government should introduce Modern Information Technology in the school curriculum so that teachers can get exposed to the techniques and strategies of MIS use in school administration while each of the Colleges, as a matter of policy, should make deliberate efforts to ensure that staff and students are computer literate. 7 Colleges of Education in Nigeria?" 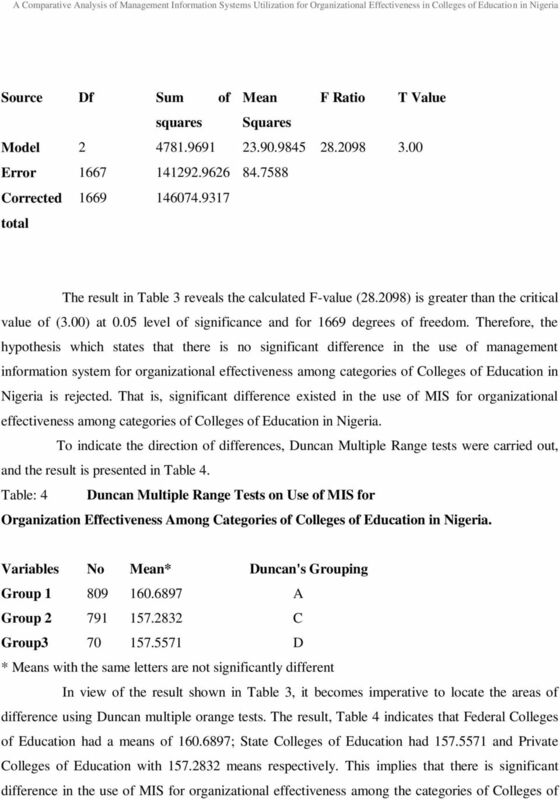 To answer this research question, data collected on the provision of MIS equipment 'in the Colleges were analyzed using frequency counts, mean scores and percentages of responses to items on "Management Information System Measurement Questionnaire" as shown in Table 1. 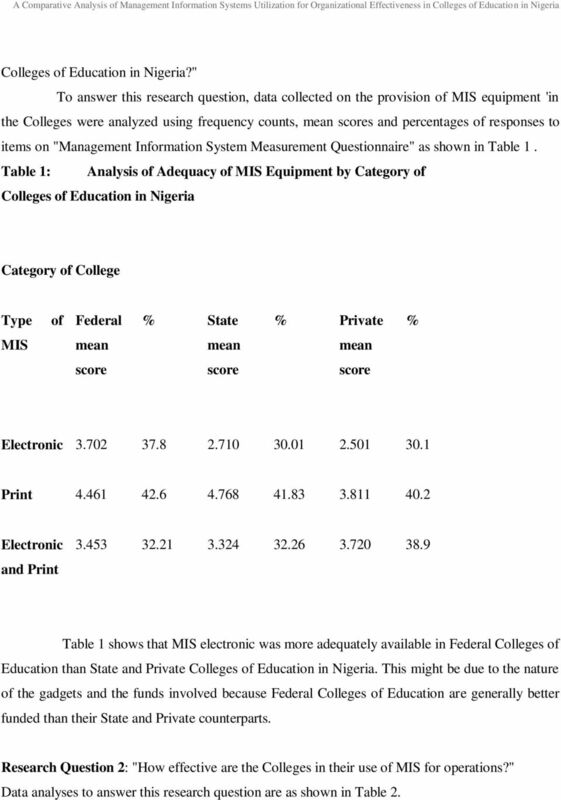 Table 1: Analysis of Adequacy of MIS Equipment by Category of Colleges of Education in Nigeria Category of College Type of Federal % State % Private % MIS mean mean mean score score score Electronic Print Electronic and Print Table 1 shows that MIS electronic was more adequately available in Federal Colleges of Education than State and Private Colleges of Education in Nigeria. This might be due to the nature of the gadgets and the funds involved because Federal Colleges of Education are generally better funded than their State and Private counterparts. Research Question 2: "How effective are the Colleges in their use of MIS for operations?" Data analyses to answer this research question are as shown in Table 2. 10 Education in Nigeria. Federal Colleges of Education were found to rank first in MIS utilization for organizational effectiveness in Colleges of Education in Nigeria. Next in rank order was the State Colleges whose means score was greater than those of the privately owned Colleges of Education. 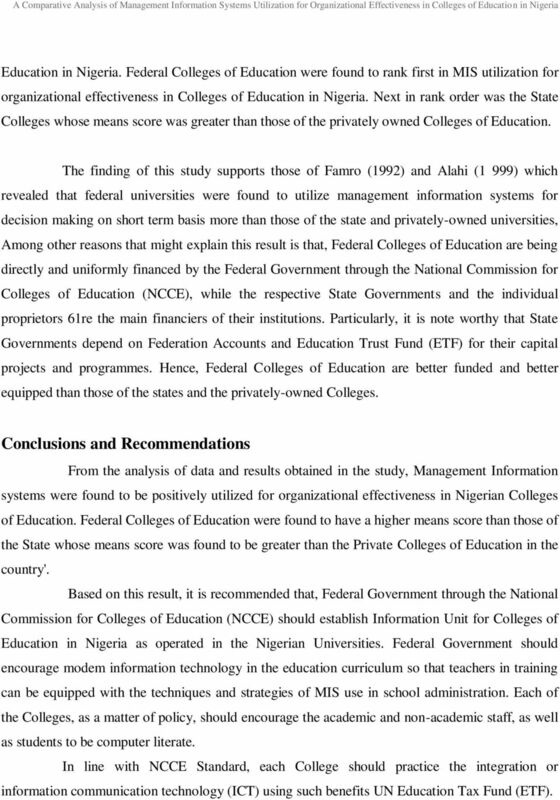 The finding of this study supports those of Famro (1992) and Alahi (1 999) which revealed that federal universities were found to utilize management information systems for decision making on short term basis more than those of the state and privately-owned universities, Among other reasons that might explain this result is that, Federal Colleges of Education are being directly and uniformly financed by the Federal Government through the National Commission for Colleges of Education (NCCE), while the respective State Governments and the individual proprietors 61re the main financiers of their institutions. Particularly, it is note worthy that State Governments depend on Federation Accounts and Education Trust Fund (ETF) for their capital projects and programmes. Hence, Federal Colleges of Education are better funded and better equipped than those of the states and the privately-owned Colleges. 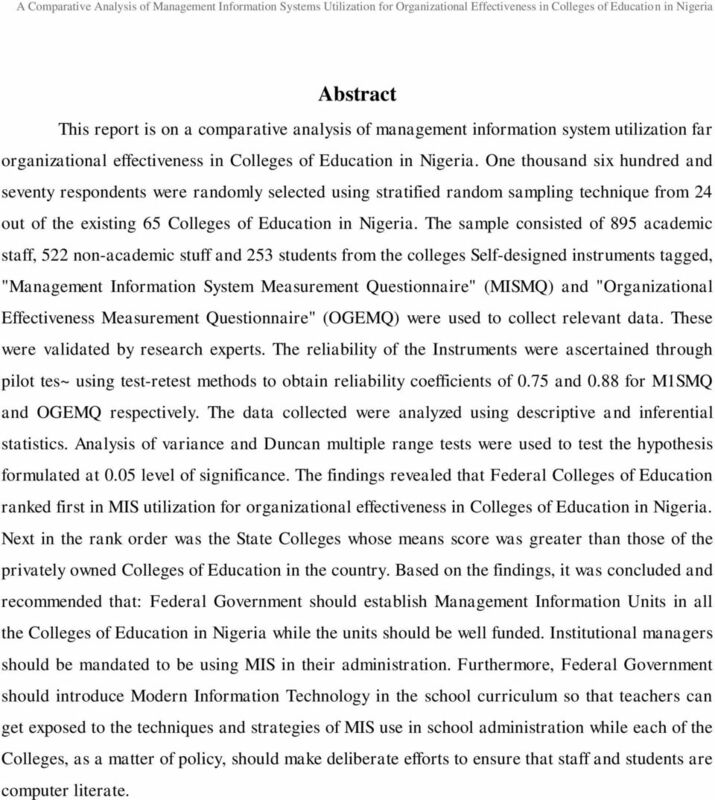 Conclusions and Recommendations From the analysis of data and results obtained in the study, Management Information systems were found to be positively utilized for organizational effectiveness in Nigerian Colleges of Education. Federal Colleges of Education were found to have a higher means score than those of the State whose means score was found to be greater than the Private Colleges of Education in the country'. Based on this result, it is recommended that, Federal Government through the National Commission for Colleges of Education (NCCE) should establish Information Unit for Colleges of Education in Nigeria as operated in the Nigerian Universities. Federal Government should encourage modem information technology in the education curriculum so that teachers in training can be equipped with the techniques and strategies of MIS use in school administration. Each of the Colleges, as a matter of policy, should encourage the academic and non-academic staff, as well as students to be computer literate. In line with NCCE Standard, each College should practice the integration or information communication technology (ICT) using such benefits UN Education Tax Fund (ETF). 12 References AbdulKareem, A.Y, (1988). Impact of school resource management on school effectiveness in selected Secondary Schools in Kwara Slate. Unpublished Ph.D. thesis, University of llorin, Ilorin. Abiri, J.O. (2006). Elements of education measurements and statistical techniques in education. Ilorin: University of llorin Press. Adamu, A.U. (2001). Information management and college administration, In K.Isyaku, e.m. Anikweze, A.A. Maiyanga and M. Olokun (Eds. ), Teacher education in the information technology age. Abuja: NCCE. 142 Ajayi, J.A. (1995). Influence of principals' communication styles on teachers Effectiveness on selected Secondary Schools of Odo-Otin LGA. Osun State. Unpublished M.Ed. Project, University of llorin, llorin. 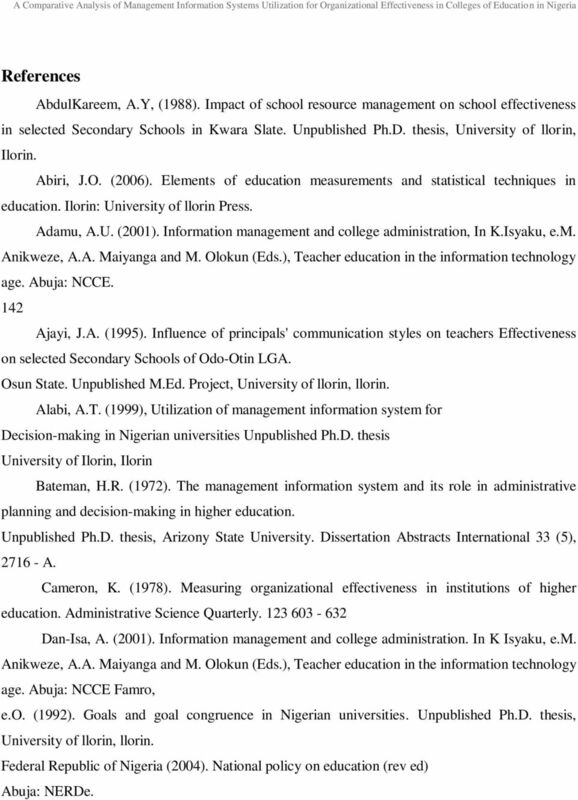 Alabi, A.T. (1999), Utilization of management information system for Decision-making in Nigerian universities Unpublished Ph.D. thesis University of Ilorin, Ilorin Bateman, H.R. (1972). 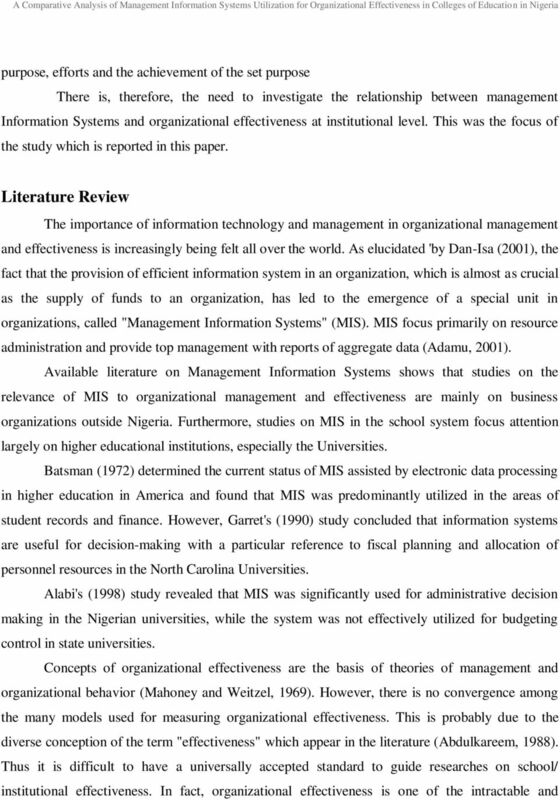 The management information system and its role in administrative planning and decision-making in higher education. Unpublished Ph.D. thesis, Arizony State University. Dissertation Abstracts International 33 (5), A. Cameron, K. (1978). Measuring organizational effectiveness in institutions of higher education. Administrative Science Quarterly Dan-Isa, A. (2001). Information management and college administration. In K Isyaku, e.m. Anikweze, A.A. Maiyanga and M. Olokun (Eds. ), Teacher education in the information technology age. Abuja: NCCE Famro, e.o. (1992). Goals and goal congruence in Nigerian universities. Unpublished Ph.D. thesis, University of llorin, llorin. Federal Republic of Nigeria (2004). National policy on education (rev ed) Abuja: NERDe. 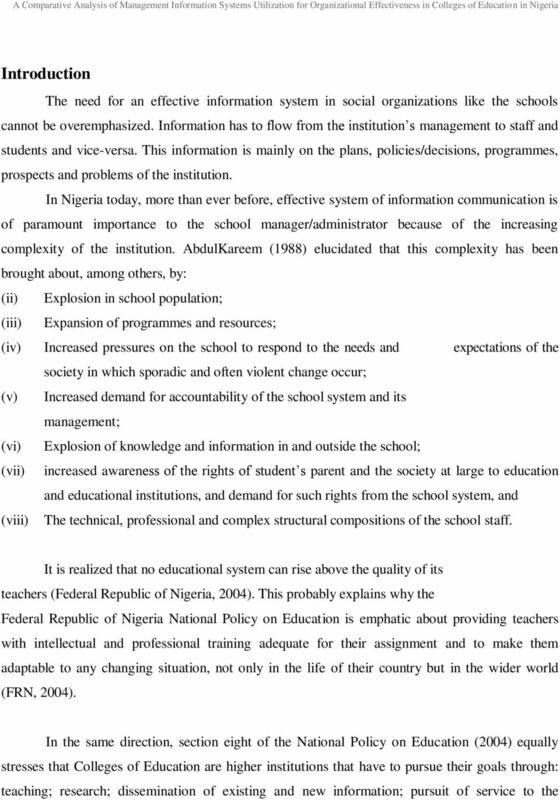 MANAGEMENT OF EDUCATIONAL FACILITIES IN NIGERIAN SECONDARY SCHOOLS: THE ROLES OF ADMINISTRATORS AND INSPECTORS. Online or on campus student: New Mexico State University MPH Program NCHEC Seven Areas of Responsibility and Competencies (www.nchec.